These Canons are based on the originals drafted by Archbishop Norman Dutton and amended by Archbishop John Langley. They are specifically raised for use by the Province of United Kingdom, and it is expected that all Provinces will use these as the basis for raising their own local versions. We the Most Reverend Doctor Stuart James Lawson, by the Grace of God, Metropolitan Archbishop of The Anglican Episcopal Church International, Primate of Australia, India & Oceania, after prayer and deliberation herewith promulgate the following Canons and Standing Orders for the good order of the Church this Sixteenth day of October in the year of Our Lord 2015. 1. These are the Canons of the Anglican Episcopal Church International, a totally independent communion of Churches and Clergy committed to, and following the Anglican traditions in doctrine and worship, and herein after referred to as “the Church”. 2. The Archbishop and the College of Bishops shall govern the Church. During any vacancy in the office of Archbishop the College of Bishops shall discharge all the duties of the Archbishop until a Successor has been elected, installed and enthroned in his stead. 3. The College of Bishops shall in the event of a vacancy in the office of Archbishop convene an Electoral College to choose a new Archbishop from amongst their number. Each Bishop shall be entitled to a single vote; the Archbishop shall be elected on a first past the post ballot system. When elected by the majority of his peers the Archbishop shall be Installed and Enthroned at an early opportunity in accordance with the established customs of the Church. At the time of his election the length of his initial term of office shall be determined and on the completion of the said term, he may be re-appointed for a similar period of time, at the end of his second period in office, he shall however not be eligible for re-election, but will then and then only be given the honorary title of Archbishop Emeritus. An Archbishop Emeritus shall be entitled to retain his seat in the College of Bishops and to speak on any subject but will not have any voting rights. 4. The Church will be in Full Communion with all Churches of like Faith and Doctrine especially with the Continuing Anglican Churches throughout the world. 5. The Church is rooted in the teaching of the historic Church enshrined in the Creeds and the teaching of all the Ecumenical Councils of the Christian Church, as developed and amended in the Anglican tradition. As such it is a Continuing Church of the traditional Anglican Communion. We acknowledge that Jesus Christ is the Head of the Church and that we are His servants in this world, keeping to the Faith as given. That we hold to the doctrine as revealed by God in the Holy Scriptures, the Canon known as the King James Version of the Holy Bible as holding all things necessary for salvation. We use the Book of Common Prayer in any such version as may be duly authorised to maintain orthodox liturgy and a common practice of worship. We hold to the 39 Articles of Religion as may be applied to time and place, holding the principle that in Scripture, Tradition and Reason, all things may be for God’s peoples necessity and common welfare. We hold to the Holy Orders of Bishops, Priests and Deacons, and we believe that in accordance with the teaching of Holy Scripture and the traditions of the church that all who hold these Orders must be men of high moral character. We hold that all congregations are independent and own any properties in common. The clergy are held in common by all and for all. The Communion serves its parishes whilst the clergy serves the Body of Christ. 7. No Bishop of the Church will enter into any agreement for Inter-Communion with any other church or ecc1esial body without the consent of the Archbishop in writing. 8. No Bishop of the Church will take it upon himself to act as Episcopal Visitor to any body or Religious Order whatsoever without the consent of the Archbishop in writing. 9. No Bishop of the Church will enter into any arrangement whereby he engages in a personal Prelature with any Clerk in Holy Orders in any circumstances whatsoever without the consent of the Archbishop in writing. 10. No Bishop or Priest of the Church will con-celebrate the Eucharist with a woman priest or Bishop of any other jurisdiction whatsoever. 1. By divine institution, there are in the Church sacred ministers who are also called clergy, the others are called lay people. The orders of the clergy shall be the traditional orders of Bishops, Priests and Deacons handed down to us from the earliest times. 2. According to the traditions of the earliest church, no woman shall be ordained into any state of Holy Orders. 3. The ancient non-ordained Order of Deaconess shall be preserved, and it shall be open to the Archbishop to appoint any woman of devout character and proved fitness, to the Order of Deaconess. The Archbishop shall define the duties of the Deaconess at the time of her appointment. No-one shall be admitted to the Order of Deaconess under the age of twenty five years, and until she shall have laid before the Archbishop testimonials showing that she is a communicant of the church in good standing, and that she possesses such characteristics as, in the judgment of the persons testifying, fit her for the duties of that office. No woman shall be recognised as a Deaconess until she has been admitted to that office by a Bishop, at a Service prescribed for that purpose, as approved by the Archbishop. 4. In addition, the duties of Archbishop, Vicar General, Chancellor, Theologian, Secretary, Treasurer, Registrar, Director of Vocations and any other necessary and appropriate appointments may be conferred by the Archbishop in his absolute discretion as the need arises. The Archbishop is not obliged to fill any such vacancy as may arise. The Archbishop may create any other new appointment as may in his judgment become necessary for the good order and governance of the Church. 5. The appointments of Secretary, Treasurer, Chancellor and Registrar shall be open to the Laity. 6. No cleric or lay office holder in the Church shall be an employee of the Church under any circumstances. It is a Condition Precedent of any License or appointment in the Church that the licensee or appointee understands and accepts this from the beginning. 7. There shall be no compulsory retirement age for any office holder within the Church, clergy or lay; all appointments shall be for life unless indisposed by ill health. 8. A Bishop will carry the title The Right Reverend, and will customarily be addressed as Bishop (Christian name). 9. Priests will carry the title The Reverend, and will customarily be addressed as The Reverend or Father (Christian name). 10. Deacons will carry the title The Reverend and will customarily be addressed by their Christian name. 11. Deaconesses will carry the title Deaconess and will customarily be addressed by their Christian name. 12. A Priest holding the appointment of Vicar General or Dean of Theology shall carry the title of The Very Reverend, and will otherwise be customarily addressed as a priest. 13. A cleric other than a Bishop holding a Diocesan appointment as a Secretary, Treasurer, or Director of Vocations etc. shall at the discretion of the Archbishop carry the title The Reverend Canon in addition to any other distinctions. 14. The Chancellor shall be a person recognised as learned in the law of any national legal Jurisdiction within the Diocese and shall carry the customary title of The Worshipful, in addition to any other distinctions in accordance with custom, and when sitting in the Chancellor’s Court shall be addressed as Your Worship. 15. It shall be open to the Archbishop to approve the appointment of a Vice-Chancellor upon the request of the Chancellor, should the need arise. 16. The Registrar shall ordinarily be a person admitted to the Roll of Solicitors of the relevant country where the Province exists. The appointment of the Registrar shall be on the recommendation of the Chancellor, subject to the approval of the Archbishop. 17. The Registrar shall be a legal advisor to the clergy and laity as required, and shall sit as Clerk to the Chancellor’s Court in accordance with ecclesiastical custom. It shall be open to the Chancellor to ask any Vice-Chancellor to sit as his Clerk should he judge it necessary and expedient. 18. It shall be open to the Archbishop to confer such traditional honorary titles as he sees fit on ordained holders of any diocesan appointment, or not as the case may be. It shall be open to the Archbishop to confer honorary titles on any members of the clergy in recognition of special service or other worthy contribution. 19. All titles of honour except that appertaining to the Chancellorship and the appointment of Registrar endure for life unless the College of Bishops exercises its authority to remove them for good and pressing reason. Only the current Chancellor is The Worshipful although it shall be open to the Archbishop at his absolute discretion, to confer the title Emeritus on former holders of the office after long and distinguished service to the Church. 20. In accordance with the Archbishop’s historic position as the representative of the true Catholic Church deriving from the Medieval Succession it shall be open to the Archbishop to grant academic honours in the form of honorary degrees in Theology, Divinity, Ministry, Church Music and Canon Law. These will be in the form of (Hon) D.D., (Hon) Th.D., (Hon) D.Min., (Hon) D.C.Mus., (Hon) D.CL. etc. They will be granted at the Archbishop’s absolute discretion. The use of such degrees by clergy in their non-clerical life without the abbreviation (Hon) is absolutely forbidden, and may result in a Chancellor’s hearing if so used. 21. Where the needs of the Church require and ministers are not available and only at the request of a Bishop when appropriate, lay people may exercise the ministry of the word, .preside over liturgical prayers, confer emergency baptism and distribute Holy Communion of the pre-consecrated elements. In extreme emergency any baptised person may ask for God’s blessing on the soul of a person about to die. 23. Before candidates are accepted for ordination, they must submit documentation of their baptism and confirmation. In cases where such documentary attestation is impossib1e, the candidate may instead at the discretion of a Bishop swear an affidavit or Statuary declaration before a Magistrate or a Commissioner for Oaths that they have been baptised and confirmed, giving such information as they are able. 24. In order correctly to confer the Orders of Priesthood or Deaconate, it is required that, in the judgement of the Bishop, the candidate possesses the requisite qualities and is considered beneficial to the ministry of the Church. 25. The Bishop must ensure that before a person is promoted to any order, they are properly instructed concerning the order itself and its obligations. The Archbishop shall have absolute discretion as to the nature of such instruction, the need for it, or otherwise. 26. The Bishops of the Church agree not to discriminate with regard to the promotion in Orders on the basis of race, ethnic group, physical disability, social group, means or academic achievement. Any refusal to promote in Orders any person will only be for good, sufficient and stated reason in the judgment of a Bishop, for example, mental incapacity. 27. Only those are to be promoted to Orders who, in the prudent judgement of the Bishop, all things considered, are of good faith, motivated by the right intention, endowed with wisdom, held in good esteem by a group of people who know them well and have achieved a moral probity and virtue and possess the emotional, psychological and spiritual qualities appropriate to the Order to be received. 28. The Priesthood may be conferred only upon those who have completed their twenty-fifth year of age, and possess a sufficient maturity. There would normally be an interval of at least six months between the Deaconate and the Priesthood. The Deaconate may be conferred only upon those who have completed their twenty-third year of age. 29. Any person over the age of fifty-five years, believing that he has a genuine call to the ministry of God’s word may apply to a Bishop, to have his vocation tested and, subject to a favourable outcome, and with the approval in writing of the Archbishop may be ordained a Permanent Deacon, and in that capacity be appointed to assist a Priest in his own locality. 30. Clergy who have been ordained already according to the traditions of the One, Holy, Catholic and Apostolic Church can be incardinated into the Church. If they wish to be Incardinated into and licensed for their ministry then they should apply to the Archbishop, who will admit them, or not, at his absolute discretion, subject to any conditions that he may lay down. Clergy from other churches who have not been Episcopally Ordained, or who are unsure whether they have been ordained in a valid Apostolic Succession may choose to have the Sacrament of Orders conferred or conferred conditionally. 31. An Ordination is to be celebrated during public Holy Communion. The minister of ordination is without exception a Consecrated Bishop. 32. After an ordination, the names of the individuals ordained, the name of the ordaining Bishop, and the date and place of ordination are to be entered into a Register of Services. 33. The ordaining Bishop is to give to each person ordained Priest or Deacon an authentic certificate of the ordination received. Such document is normally referred to as Letters of Orders. It must contain the date and place of ordination, and a statement that it took place during a public celebration of Holy Communion and the seal and signature of the ordaining Bishop. 34. It is usual, though not essential, for the principal consecrating Bishop at an Episcopal Consecration to have at least two other Bishops with him. However, where this is not practicable, letters from those who would wish to co-consecrate will be accepted in absentia. 35. No rites of ordination will be used without the approval of the Archbishop and such rites will be based on those openly approved within the Church. 36. All Bishops have the power to ordain Deacons and Priests of the Church. They must both satisfy themselves of the correctness of the rite used and the required intention to ordain. Each ordaining Bishop must issue their own respective ordination documents. The Archbishop shall be informed in advance of all ordinations, and shall have an absolute right of veto upon any ordination that he considers undesirable. His decision shall be led by the Holy Spirit and will be unquestionable. 37. No Bishop within the Church can consecrate another Episcopal candidate within the Church without the consent and participation of the Archbishop. 38. No Bishop will take part in the consecration of anyone as a Bishop in any other jurisdiction without the consent of the Archbishop in writing. 39. No Bishop will take part in the ordination of a woman as a Deacon or Priest, or the Consecration of a woman as a Bishop in any other jurisdiction. 40. To be a suitable candidate for the Episcopate, a person must be outstanding in his ability to show Christian love to all. A person who in the prudent judgement of the Archbishop all things considered, is considered to be of exceptional faith, wholly motivated by the right intention, deeply endowed with wisdom, held in the highest esteem by a group of peop1e who know him well and have achieved a developed sense of moral probity and virtue and clearly possess the emotional, psychological and spiritual qualities appropriate to the order to be received. They must be at least 35 years of age. 41. In exercising his pastoral office, a Bishop is to be solicitous for all people without exception. He is to have a special concern for all clergy and for all vocations. 42. A Bishop is bound to give an example of holiness in charity, humility and simplicity of life. Since he is the principal dispenser of the mysteries of God he is to strive constantly that Christ’s faithful may grow in grace through the celebration of the sacraments, and may know and live the paschal mystery. 43. In the Church, a parish is not limited by geographical boundaries, it embraces all who have contact with a particular Priest. The Priest is their proper pastor. He exercises the pastoral care of the community entrusted to him under the guidance of a Bishop, whose ministry of Christ he is called to share, so that for this community he may carry out the office of teaching, sanctifying and serving with the cooperation of other Priests or Deacons and with the assistance of lay members of Christ’s faithful. 44. A Priest has the obligation to ensure that the word of God is proclaimed in its entirety to those within his parish. He is to see that the lay members of Christ’s faithful are instructed in the truths of the faith. He is to foster works that promote the spirit of the Gospel, including its relevance to social justice. He is to have a special care for the Christian education of children and young people. 45. A Priest is to strive to ensure that Christ’s faithful are nourished by the devout celebration of the Sacraments. 46. So that the Priest may fulfil his office of pastor, he is to strive to know those entrusted to his care. He is therefore to visit their families, sharing especially in their cares, anxieties and sorrows, comforting them in the Lord. 47. He is to help the sick and especially the dying in great charity, solicitously restoring them with the Sacraments and commending their souls to God. He is to be especially diligent in seeking out the poor, the suffering, the lonely, those who are exiled from their homeland, and those burdened with special difficulties. 48. The Priest is to recognise and promote the special role that lay members of Christ’s faithful have in the mission of the church, fostering their associations that have loving purposes. He is to ensure that the faithful are concerned for the local community and that they take part in and sustain works which promote the community. 49. The functions especially entrusted to the Priest are as follows: the administration of the sacrament of baptism, the administration of Confirmation to those in danger of death or at the request of a Bishop, the anointing of the sick and the imparting of the Apostolic blessing, the conduct of marriages, the conduct of funerals, the celebration of the Eucharist and also confession. 50. A Priest is to be responsible for the keeping of proper registers, that is, of baptisms, of marriages and of deaths, and any other services conducted. He is to ensure that all entries are accurately made and that the registers are carefully preserved. 51. Fees and stipends are not charged for any services or ministrations. Donations towards expenses incurred can be made. 52. Any assets and income of the Church shall be applied solely in furtherance of the ministry of the Church and no portion shall be distributed directly or indirectly to members of the Church except as bona fide compensation for services rendered or expenses incurred on behalf of the Church. 54. In the event of the Church being dissolved, any monies that remain after the satisfaction of all debts and liabilities shall be transferred to another church with similar purposes which is not carried on for the profit or gain of its individual members. 1. The Church requires its clergy to wear clerical dress and to use appropriate vestments when celebrating the Sacraments and leading other liturgies. Clergy wear clerical dress not to indicate their status but as witness to their vocation. Clergy wear appropriate vestments in order to be more effective channels of grace, so that they may personally be decreased and Christ within them increased. There will be local variations to that listed below and the Archbishop is to approve any local variation from this in accordance with local custom. 2. Wearing clerical dress is itself a form of ministry. Not only do those who wear it bear witness to the fact that they are citizens of the Kingdom of Christ but they also present themselves to the world as people who can be approached when people are in need of the love of Christ. At ordination clergy are set apart and their very beings aligned with Christ in a special way precisely so that he might touch the world through us and use us as a catalyst for his grace. It is therefore logical that they should look different and be easily identifiable as people who stand in the person of Christ. 3. Ordinary clerical dress consists of a shirt and a clerical collar. Shirts may be either black or grey. Black is the traditional colour because black was understood to absorb negativity, which is then neutralised in the ordained person. In the Anglican tradition, Roman Purple or Violet are only won by Bishops. Shirts of rainbow colours for the clergy are not acceptable. Clerical collars may be of the Roman type or inserted type as may be most convenient. 4. Clergy may also wear cassocks as part of their ordinary clerical dress and traditionally the cassocks was not worn over any other clothes but was considered as a garment in its own right. Cassocks are worn in liturgical celebrations; particularly choir Offices when they are worn with a surplice, scarf/tippet and academic hood where applicable. The ordinary colour of a cassock for the clergy is black, a black cincture and cape may also be worn. Cassocks come broadly in two different styles, a Roman style which buttons up the front, and a Sarum or wrap around style. The Sarum cassock is preferred but either is acceptable. 5. Clergy who serve in a Bishop’s ‘household’ for example as secretary or chaplain wear a Roman Purple cincture. Any Vicar General, Archdeacons, Deans and Canons may have red buttons and braiding on their cassocks and capes and wear a Roman purple cincture. For many liturgical celebrations clergy will wear a surplice over their cassocks with a scarf/tippet. 6. When celebrating the Eucharist in normal circumstances all clergy should wear an alb. An alb is a long white garment that covers the body from neck to ankles. If the alb is not hooded an amice should be worn under it. An amice is a rectangular piece or white cloth with strings, which cross over the breast and are tied around the waist. It may have an embroidered upper edge known as the apparel which may be coloured according to the liturgical season (see below.) The amice serves to hide the collar of the shirt underneath the alb. No ‘secular’ clothing should be visible once the alb is on. 7. Over the alb the girdle is fastened. This recalls the rope worn round the waist of the high priest at the Temple in Jerusalem that was used to pull him out should he collapse in the Holy of Holies. The colour of the girdle can match that of the liturgical seasons, but is generally white. 8. Deacons and Priests may then place a maniple on their left forearm (though this is entirely optional). This is a small band of coloured cloth. It was originally used as a wiping cloth. 9. It is obligatory for Deacons and Priests to wear the stole. At the Eucharist the Priest may wear the stole crossed over his breast and fixed in position with the ends of the cincture or girdle. This symbolises the sacrifice of Christ that is about to be remembered. However, some modem sets of vestments are designed for the stole to be worn over the chasuble. Deacon’s stoles are worn over the left shoulder with the ends tied on the right hip. The stole is the symbol of the authority of the Priesthood / Deaconate. The colour of the stole will usually match that of the liturgical season. 10. It is highly desirable that the Priest should wear a chasuble when celebrating the Eucharist. The word means ‘little house’ and it has also been traditionally seen to represent the love of God, which ‘covers all things’. It derives from the normal outdoor wear during the time of the Roman Empire. 11. Deacons may wear a dalmatic over their alb and stole. The colour of the chasuble and dalmatic will usually match that of the liturgical season. 12. The ordinary wear of the Deaconess shall be a white or pale blue blouse or shirt with a collar and dark blue or black skirt or trousers. Where a skirt is worn it shall cover the knees in the standing position. Liturgical wear shall be a white alb with girdle. The girdle may be the colour of the Liturgical season or plain white. A Deaconess may also wear a specially designed collaret with a small pectoral cross attached to its point. 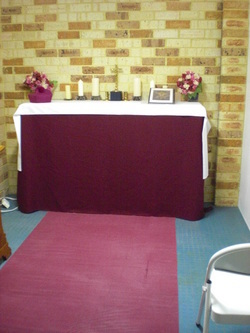 The collaret may also match the colour of the liturgical season. Deaconesses will not normally wear the cassock and surplice which are reserved solely for male clerical wear. 13. Licensed Lay Readers when appointed and commissioned shall wear the cassock and surplice or alb and a readers blue scarf / tippet. 14. When a baptism is celebrated in the context of the Eucharist, then Eucharistic vestments should be worn. Eucharistic vestments will not be worn when the Eucharist is not being celebrated. In an emergency a baptism can be celebrated without vestments. 15. For a baptism; Priests may wear an alb and white stole (with the stole hanging down, not crossed) or a cassock, surplice and scarf / tippet. Deacons should wear alb and stole (with the stole worn in the Deacon style) or a cassock, surplice and scarf. 16. Reconciliation: In a formal context the Priest should wear a cassock and a purple stole. In an informal context a stole will suffice. Small reconciliation stoles which are double-sided white / purple are available and Priests should carry one around with them at all times in case they are required to administer these in an emergency. 17. Marriage: priests may wear an alb and a white stole. Deacons should wear alb and stole (with the stole worn in the Deacon style) or a cassock, surplice and stole. 18. In administrating to the Sick: Priests may wear an alb and purple stole with the stole hanging down, not crossed or a cassock, surplice and stole. In an emergency the reconciliation stole alone will suffice. 19. Funerals: Priests may wear either an alb and a black or purple stole (with the stole hanging down, not crossed) or a cassock, surplice and stole. Deacons should wear alb and stole with the stole worn in the Deacons style or a cassock, surplice and scarf and tippet. 20. Blessing of houses: Priests may wear an alb and white stole (with the stole hanging down, not crossed) or a cassock, surplice and scarf / tippet. 21. Copes: Copes may be worn for the celebration of Baptisms outside of the Eucharist and for solemn processions and the formal celebration of the Eucharist. 22. Bishops: the normal wear of a Bishop shall be a cassock with rochet and red chimere, and tippet, although a black chimere may be worn for funerals. A cope and mitre should be worn on ceremonial occasions. 23. The Colours of the Liturgical Seasons. White: The sum of all colours so it can be worn at any time. Used particularly for the great feasts of Our Lord, including during Christmastide and Eastertide. It may also be worn at funerals to symbolise the resurrection. Red: Red as the symbol of fire and blood is worn on Pentecost and on the feasts of Martyrs, Palm Sunday and may be worn on Good Friday. Green: Green, the colour of hope, is worn during what the church calls ‘Ordinary Time’. Purple: Purple is the symbol of penitence, humility and longing. It is worn during Lent and Advent and on All Soul’s Day and may be worn for funerals. Rose: Rose as the symbol of refreshment and joy is traditionally worn on the third Sunday of Advent and the fourth Sunday of Lent. Black: Black is the symbol of sadness and mourning. It may be worn on Good Friday, All Soul’s Day and Funerals. It has become less fashionable in recent years and has largely been replaced in some jurisdictions by Purple. The Church will continue to allow its clergy to wear Black if they so wish. A White Stole because white can be worn at any time. An alb and amice if required, with girdle. A Black scarf / tippet. The Sacraments of the Church are the Sacraments of the One Holy Catholic and Apostolic Church, and are the outward and visible signs of an inward and spiritual Grace. 1. The Sacraments of the New Testament were instituted by Christ the Lord and entrusted to the Church. As actions of Christ and of the Church, they are signs and means by which faith is expressed and strengthened, worship is offered to God and our sanctification brought about. Thus they contribute in the most effective manner to establishing, strengthening and manifesting ecclesiastical communion. 2. Ministers may not properly deny the Sacraments to those opportunely ask for them. 3. Because it imprints a character, the Sacrament of Baptism cannot be repeated. 4. By Baptism people are freed from sins, and are born again as children of God and, made like Christ by an indelible character, and are incorporated into the Church. 5. Baptism is to be conferred either by total immersion or by pouring or sprinkling of water with the appropriate words, using any rite that may be approved by the Archbishop. The Ordinary minister of Baptism is a Bishop, Priest or a Deacon, but may in cases of emergency be carried out by a Deaconess, a Lay Reader or any confirmed member of the Church. 6. As far as possible in the case of Infant Baptism, the child being baptised shall be assigned at least one Godparent. The parents are to choose the Godparents and they can be any Baptised Christian of full age. 7. The Priest must carefully and without delay record in the Register of Baptism the full names and date of birth of the baptised, the minister, the parents, the Godparents and the place and date of the baptism. 8. Confirmation confers a character. By it the baptised continue their path of Christian initiation. They are enriched with the gift of the Holy Spirit and are more closely linked to the Church. They are made strong and more firmly obliged by word and deed to witness to Christ and to spread and defend the faith. 9. Confirmation is conferred by anointing with chrism on the forehead and by the laying on of the hands by the confirming Bishop, and by the appropriate words. 10. The chrism to be used in the Confirmation should have been consecrated by a Bishop. 11. The ordinary minister for the Confirmation is a Bishop. Where it is not expedient or convenient for a Bishop to confirm, a Priest can also validly confer Confirmation at the request of a Bishop. In the normal course of events the nominated Priest should be a Canon of the Church. 12. To establish that Confirmation has been conferred, the full names of those confirmed, the Bishop, the parents and the place and date of the Confirmation shall be recorded in the Register of Confirmations. 13. The most august Sacrament is the Eucharist, in which Christ the Lord is present with us and by which the Church continually lives and grows. The Eucharist, the memorial of the death and resurrection of the Lord, is the summit and source of all worship and Christian life. By it, the unity of God’s people is signified and brought about, and the building up of the body of Christ is perfected. 14. The ordinary minister of the Sacrament of the Eucharist is a Bishop or a Priest and where there are a number of such present they may concelebrate. 15. All Baptised people are to be invited to receive the Holy Communion. This should include all those from other Christian denominations the only requirement being a love of the Lord Jesus Christ. 16. The Eucharist must be offered in bread, and in wine to which a small quantity of water has been added. Reception of the consecrated host in the hands is the usual way in accordance with the Anglican tradition. 17. In Reconciliation those who confess their sins to a Priest, and are sorry for their sins and have a purpose of amendment, receive from God, through the absolution given by that minister, forgiveness of the sins they have committed after baptism, and at the same time they are reconciled with the Church, which by sinning they wounded. 18. Only a Bishop or Priest is the minister of Reconciliation. 19. The anointing of the sick, by which the Church commends to the Lord those who are dangerously ill so that He may support and save them, is conferred by anointing them with Holy Oil and pronouncing the relevant words. 20. The Holy Oil to be used in the anointing of the sick is normally blessed by a Bishop but in the case of necessity any Priest may bless the oil, but it should only be blessed during the celebration of the Eucharist. 21. The minister is to apply the anointing oil with his own hands, using the relevant words. If for some very special medical reason it is indicated that anointing by hand would be inappropriate then and then only may an anointing spoon be used. 22. A Bishop, Priest or a Deacon can validly administer the Sacrament of the anointing of the Sick. 1. Matrimonial consent is an act of will by which a man and a woman by an irrevocable covenant mutually give and accept one another for the purpose of establishing a marriage. 2. From a marriage there arises between the two people a bond which of its own nature is permanent and exclusive. 3. Those who have the care of children have the most serious obligation and the primary right to do all in their power to ensure their children’s physical, social, cultural, moral and spiritual upbringing. 4. Pastoral care must be provided for all who experience divorce. There shall be no impediment to the remarriage of divorced people provided that the Priest is fully satisfied that such re-marriage is not undertaken lightly or without commitment, and after he has made due and diligent enquiry to ascertain the authenticity and godliness of that which is being sought. 5. A Priest can impart blessings, except those reserved to the Bishop. In accordance with the traditional practice of the One Holy Catholic and Apostolic Church throughout the world a Deacon may bless people, but not objects. 6. No cleric should attempt to exorcise the possessed without the special and express permission and guidance or the Archbishop, using only the Form of Exorcism provided and approved by the Church. Due to the possible legal ramifications, those undertaking any form of exorcism are strongly advised to consult the Chancellor in advance for advice. 7. A Bishop, Priest or Deacon of the Church may conduct a Baptism, a Marriage, a Funeral, or any other service according to the authority of their orders. 8. In the case of a marriage service in England and Wales, they may only take place in a building, which has been properly licensed for that purpose by the local authority and only then in the presence of an authorised person - the Registrar of Births, Marriages and Deaths. Marriage blessing services following a civil ceremony may however take place at any convenient location. 9. The Church does not under any circumstances recognise the civil partnership ceremonies, which take place between homosexual males or lesbian females. Clergy members found to have attended or given a blessing at such ceremonies will be subject to a disciplinary hearing in the Chancellor’s Court, which will ultimately lead to their expulsion from the Church. There will be no right of appeal against such decisions. Church Buildings & Sacred Places. 1. All the services of the Church can be held in any appropriate place. At the discretion of a Bishop, Priest, Deacon, church or lay people involved. 2. Sacred places are those, which are assigned to divine worship or to the burial of the faithful by the dedication or blessing provided for this purpose. 3. It is appropriate that places set aside for use of a Church be dedicated and blessed. The dedication and blessing of a place belongs to a Bishop, but may be delegated to another appropriate clergyman if necessary. 4. Where more than a single person gathers regularly for worship, a Bishop of the Church can be requested to dedicate the church building and agree a title for it. 5. If a Church regularly uses a building as a place for their worship then such a place can be set aside and can be named after the Church that uses it. 6. An Oratory or a Private Chapel means a place that is set aside for divine worship, for the convenience of one or more individuals. Oratories and Private Chapels may be used for other church and secular purposes when not in use for worship provided that such use is of a respectable and Godly nature according with the holiness of the place. Such buildings that may be available could include, Village Halls, Cemetery Chapels, Scout Headquarters, Social Clubs, etc., or a room which has been set apart for the purpose within a private house. 7. A document is to be drawn up recording the dedication or blessing of the place, which must be retained by the Priest in charge. 8. Sacred places are violated by acts done in them which are gravely injurious and give scandal when, in the judgement of a Bishop, these acts are so serious and so contrary to the holiness of the place that the harm needs to be repaired by means of a penitential rite. 9. Sacred places lose their dedication or blessing if they have been in great measure destroyed, or if they have been permanently made over to secular usage, whether by decree of a Bishop or simply in fact. 10. There shall be no impediment preventing the Church from using any building belonging to another Christian group or denomination with the full consent of the ordinary authority of that place. 11. There shall be no impediment preventing any Christian group or denomination using any building owned by or under the control of the Church with the consent in writing setting out the agreed terms and conditions of the usage, from the cleric normally in charge of that place.